In a bowl whisk together dry ingredients. Add melted butter and vanilla. Stir, until the mixture is evenly moist, set aside. In a large bowl, cream together 4 Tablespoons butter with ¼ cup granulated sugar, until light and fluffy. Add sour cream and beat again. In another bowl, stir together dry ingredients and add to the butter mixture. Spread half the batter at the bottom of the pan. 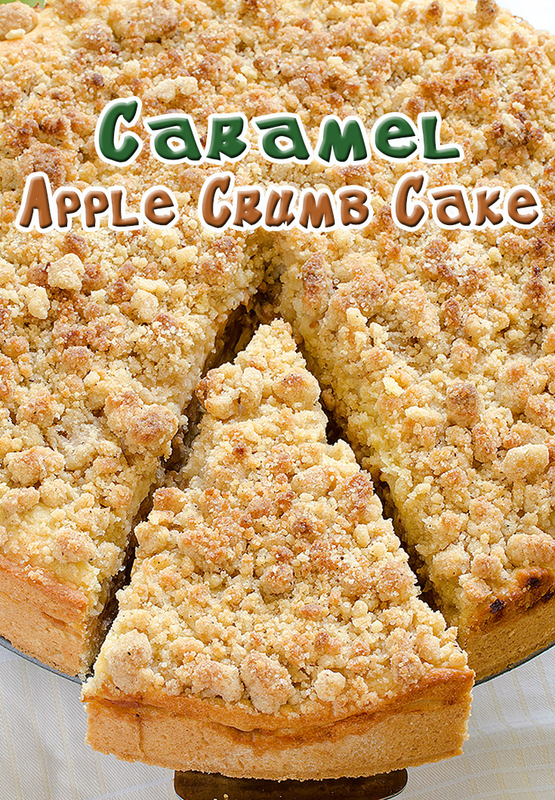 Spread the apple chunks evenly over the batter, then sprinkle crumbs over the apples. Spread the remaining batter over the crumbs and on the top spread the rest of the streusel. Grease 8 inch springform pan and line the bottom with parchment paper, set aside. Bake 35-45 minutes, or until a tester inserted in the center comes out clean. Sprinkle caramel topping over the cake, if desired.